I want to know how many books you know (from your whole life, even from when you were little, like me) that have wings. If you wonder what I mean read our comments and have fun... we sure did! these Books with Wings aren't they fun? 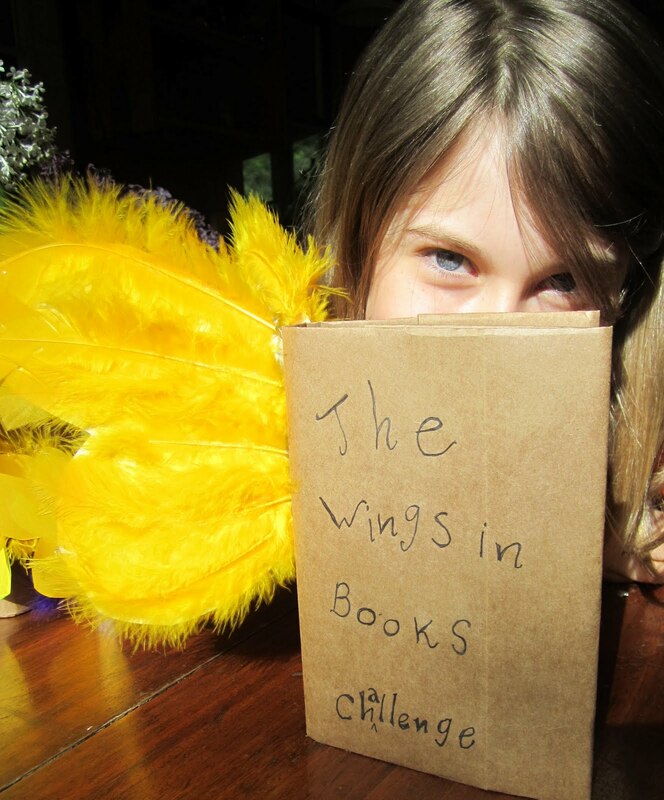 Please use the following format for your comment: Title of Book, Author, and tell us more about the wings! This book has lots and lots of wings!! The wings in this book are FAIRY wings! This book has BIRD wings!! Lots of Bird Wings! The Little Prince; Night Flight; Wind, Sand and Stars by Antoine St. Exupery. WINGS by ED Baker says Anela. we like this challenge :), nice going Little Sister! Many Waters - Madeleine L'Engle. All of the seraphim and nephilim have wings. I've said it before, and I'll say it again; I simply love Michael Perry's storytelling. Coop is just another in a series of fabulous work. The title sheds light on the reason I picked it for this particular Little Sister challenge... the story delves into the season when Michael & his family take their farming to the next level with a chicken coop & chicks. As you can imagine, it includes both the heart wrenching and hilarious. Aside from the literal "wings" on the chickens; I dare say Michael is a winged-wonder of the heart-string-tuggin' kind. Every book I read when I was The Sisters' ages. Books lifted me from the dust of my hot summers, lifted me from the shadow of my older brother, lifted me above the little sadnesses of a family near poverty, parents too busy bailing water to sail the boat into places that might have delighted me. No, it wasn't so bad, really, but books lifted me above all of this, first letting me escape and later giving me a high place from which to see further, to accept my smallness as harmonious with the bigger world. As a child, I remember reading the Golden Book, Dumbo the Flying Elephant (and of course, seeing the film by Disney). Sorry to say, the author of the actual story is a mystery to me; unless someone knows who the person was! What a magnificent story line about good triumphing derision; literally, flying above the ridicule and being made whole! The novel fictionalizes Albert Einstein as a young scientist who is troubled by dreams as he works on his theory of relativity in 1905. The book consists of 30 chapters, each exploring one dream about time that Einstein had during this period. The framework of the book consists of a prelude, three interludes, and an epilogue. Einstein's friend, Michele Besso, appears in these sections. Each dream involves a conception of time. Some scenarios may involve exaggerations of true phenomena related to relativity, and some may be entirely fantastical. The book demonstrates the relationship each human being has to time, and thus spiritually affirms Einstein's theory of relativity. just finished trickster's choice and trickster's queen, by one of my favorite authors, tamora pierce. i LOVED the crows. This book has so many wings, thats what the title is!!! One of my favorite books has wings! MAXIMUM RIDE (yay! Love this book!) by James Patterson is about 6 kids ages 6 to 14 who are 98% human and 2% bird because they were experiments in a lab. I LOVE THIS BOOK SOOOO MUCH!!!! !